When it comes to love stories, none is more well-known than that of Juliet and her Romeo. William Shakespeare literally wrote the book (or should I say play) on the notion of star-crossed lovers. The adaptations of this classic are endless, yet the public never tires of the story of love gone awry. So it goes that after 36 years, William Shakespeare‘s Romeo and Juliet has returned to the stage of the Richard Rodgers Theatre. Director David Leveaux’s version of Romeo and Juliet takes Shakespearian English and injects it into modern setting. Another added twist to the original plot is the subject of race – the Montagues are a white family and the Capulets are black. 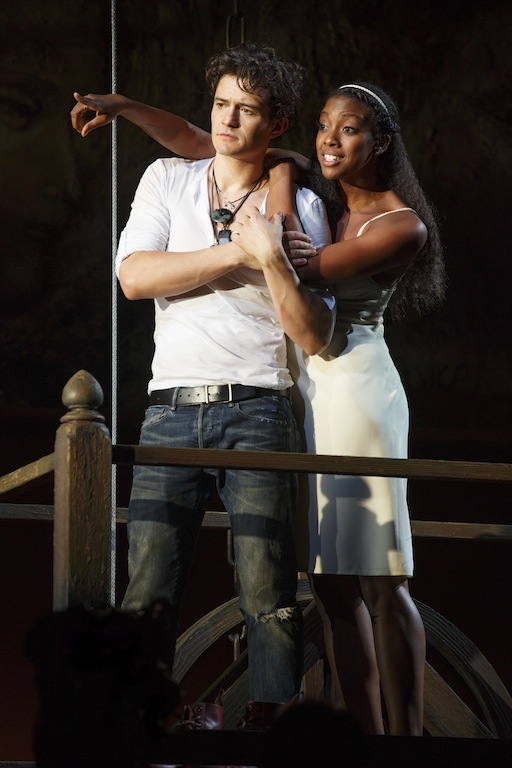 Hollywood hottie Orlando Bloom and Broadway sensation Condola Rashad play the young, ill-fated lovers. All these elements should’ve have produced results that were more explosive than a NASA rocket launch to the moon. Instead, it was more the equivalent of high school chemistry nerds experimenting after class – yeah; there was a little smoke, but no real fire (except for the random bursts of fire on stage). Although I wasn’t expecting Romeo and Juliet to declare their love on Facebook, I also didn’t expect the term ‘modern’ to be interpreted in such a banal fashion. The set, which consisted of a ginormous bell, an elevated plank of wood for a balcony, and a wall that contained a Renaissance secco, was uninspiring and a poor match for the lush verse of one of William Shakespeare’s greatest works. 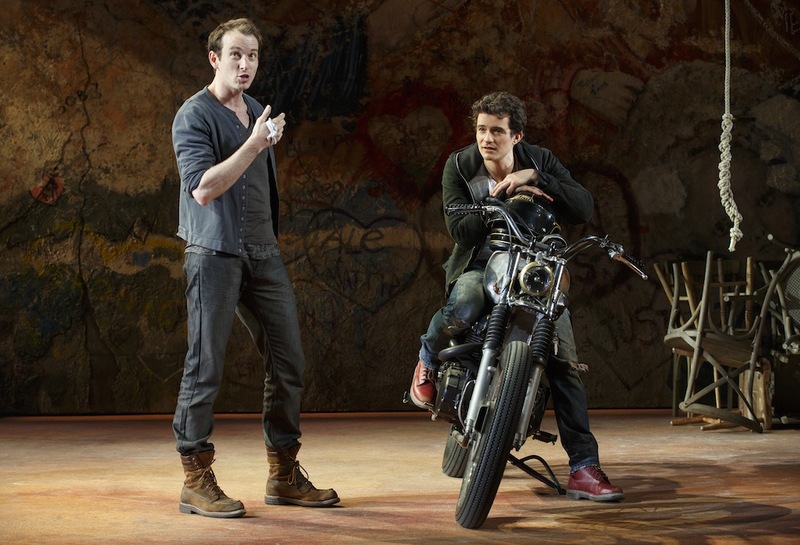 The first time Orlando Bloom appears on stage he is riding a motorcycle, and while that might be modern it is also clichéd. At the Capulet’s soiree, I thought the choreography would carry an element of hip-hop or krunking, something other than the interpretations of African dance that were exhibited on stage. The nurse walking a bicycle to deliver a message to Romeo and the parkour climbing of the graffiti-ridden mural does add a nod to a more modern era; however these devices failed to deliver on such a promising idea. The cast seem to hurry through the dialogue as if they were just trying to get it over with. Shakespearean English is a mouthful, literally, but the pace was so rushed that some of the beauty of Shakespeare‘s poetry was lost in this interpretation. While Orlando Bloom and Condola Rashad certainly looked as if they had the potential to rival the flames that occasionally appeared on stage, their scenes together were undersupplied of the heat necessary for me to believe that these two would rather die than live life apart. Brent Carver, Christian Camargo and Jayne Houdyshell’s portrayals of Friar Laurence, Mercutio and the Nurse were an absolute pleasure to watch and brought balance to this production. Director Baz Luhrmann attempted a modern interpretation Romeo and Juliet on screen in 1996, back when I thought modern versions of Shakespeare were a sacrilege, and it actually became one of my favorite depictions of this classic love story. Perhaps Leveaux should’ve taken a few notes from this film. After 36 years, this Romeo and Juliet ascended to no grander heights nor did it plateau to a great theater low. All and all it was steady and flat, just like the boards of the balcony – wooden and just plain regular. What does actor Samuel L. Jackson, Warner Bros., John Grisham and Wynwood Press have in common? The September breeze brings with it a new season and on Broadway it means the start of the fall shows. In October, A Time to Kill will make its Broadway debut, also marking the debut of an adaptation of a work from best-selling author John Grisham. Adapted for the stage by Tony Award-winning playwright Rupert Holmes A Time to Kill stars fellow Tony Award winner Tonya Pinkins and Emmy Award winner Tom Skerritt. In case you forgot, A Time to Kill tells the emotionally charged, now-iconic story of a young, idealistic lawyer, Jake Brigance, defending a black man, Carl Lee Hailey, for taking the law into his own hands following an unspeakable crime committed against his young daughter. Their small Mississippi town is thrown into upheaval, and Jake finds himself arguing against the formidable district attorney, Rufus Buckley, and under attack from both sides of a racially divided city. This drama is a thrilling courtroom battle where the true nature of what is right and what is moral are called into question. NOW I HAVE A QUESTION FOR YOU FAMERS…DO YOU LIKE FREE TICKETS? Of course you do. And if you can finish this Carl Lee Hailey quote, then you could win yourself a pair of tickets to see A Time to Kill. Please leave your answer as a comment and your email address will be automatically entered to win the tickets. Contest ends 5 p.m. September 27, 2013. Don’t miss your opportunity to see this powerful story on stage, ENTER. GOOD LUCK!